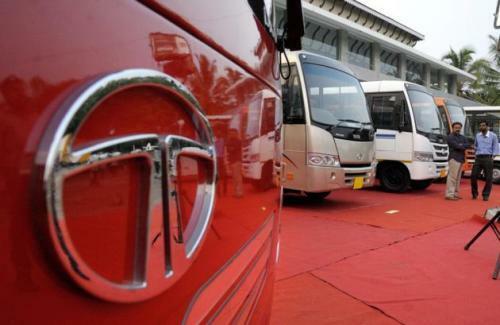 Tata Motors’ total sales (including exports) of commercial and passenger vehicles in June 2014 were 38,557 vehicles, a 27% drop over the 52,712 vehicles sold in June 2013. The company’s domestic sales of commercial and passenger vehicles for June 2014 were 34,743 units, a 29% decline over the 48,716 vehicles sold in June previous year. Cumulative sales (including exports) for the company for the fiscal were 1,09,974 units, lower by 28% over the 1,53,195 vehicles sold previous year. The company’s sales of commercial vehicles in June 2014 in the domestic market were at 26,832 units, a 27% decline compared to the 36,912 vehicles sold in June previous year. Light Commercial Vehicles (LCV) sales were at 17,212 units, a 33% decline over June previous year, while medium and heavy commercial vehicle (M&HCV) sales stood at 9,620 units, a 14% decline over June previous year. Cumulative sales of commercial vehicles in the domestic market for the fiscal were 75,165 units, lower by 30% over previous year. Cumulative LCV sales were 48,007 units, a 37% decline over the previous year, while M&HCV sales stood at 27,158 units, lower by 13% over last year. The company’s sales from exports were 3,814 units in June 2014, a 5% drop compared with 3,996 vehicles in June previous year. The cumulative sales from exports for the fiscal at 10,227 units were lower by 11% over 11,435 vehicles previous year.